Stock photo of pilot Guy Cannon with the Air Tractor AT-802, modified for bulk fuel hauling with a capacity of 4,000 litres, in Red Lake, Ontario, Canada. 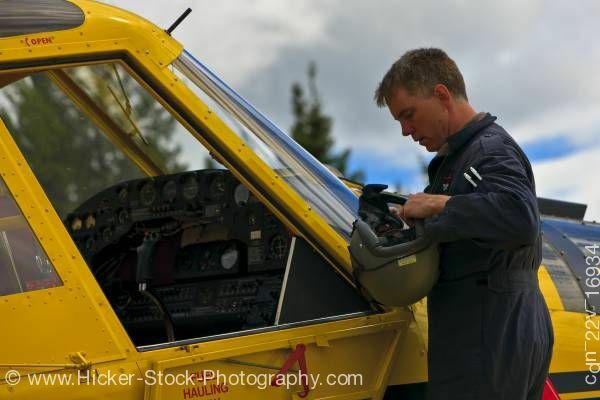 This stock photo includes pilot Guy Cannon with the Air Tractor AT-802, a bush plane on the ground in Red Lake, Ontario. This plane is yellow with some red detail and writing and is a two passenger aircraft. The Air Tractor AT-802 is an agricultural and fire-fighting aircraft that first flew in the United States in October 1990. It is is the world's largest single engine aircraft.